Star Trek Frontiers is here (and currently on a steady rotation at my table). I’m not quite ready to review it, but let’s take a look at first impressions of this highly anticipated Star Trek redux of Mage Knight. I picked up Mage Knight, against the objections of at least one other BGA host about 3 years ago. I was in the early stages of board game obsession and wanted every big, meaty, epic, long game I could get my hands on, not yet realizing just how long it takes to actually learn and play them. The game languished on my shelf for nearly two years before I got it to the table. Suffice it to say, I was upset it had taken me so long. 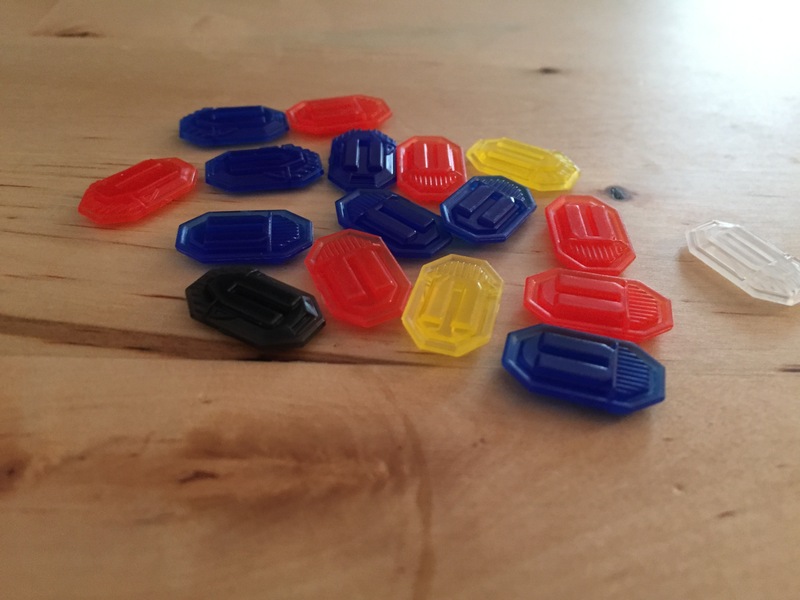 The game is fiddly, overly complex, and hard to teach. It’s also absolutely brilliant. And that brilliance has hooked me on what is quite possibly the best exploration-based solo game ever created. Did we really need a game that does almost the exact same thing in a slightly different way with a new theme? Especially for someone who already owns (and loves) the original, would this new version serve any purpose on my shelves? The answer is a bit mixed, but suffice it to say, this is a worthy addition to Vlaada’s design. I’m going to keep this fairly high level for now. I haven’t played nearly enough of this game yet to give a definitive opinion, but having cracked it open, sifted through the cards to compare them to its fantasy progenitor, and running through the first couple of scenarios, I want to share my initial impressions on what thus far is a very impressive game experience. 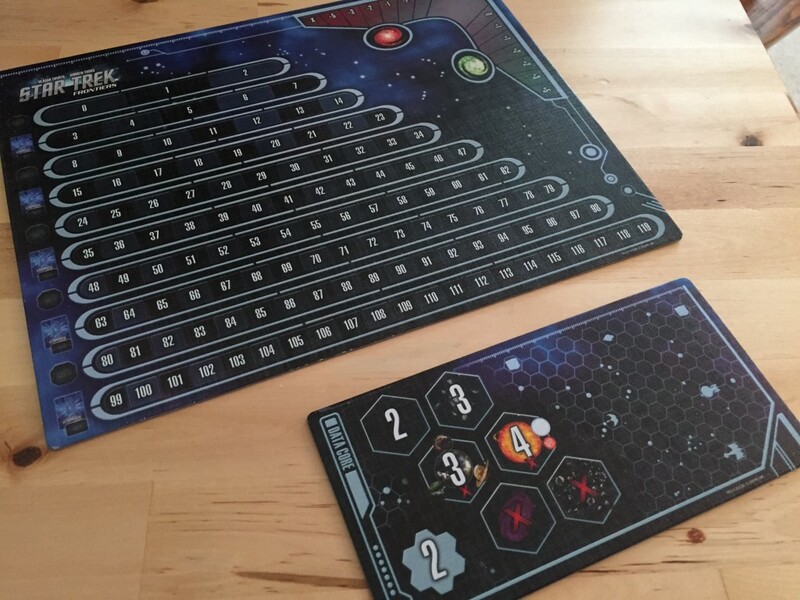 If you’ve played Mage Knight or seen it on the table, the contents of Star Trek Frontiers will look very familiar. The boards, layout of the cards, materials for the cards and miniatures, and even the rulebooks all look like reskinned components from Mage Knight. And to be honest, it’s not as pretty to look at. The Star Trek theme isn’t exactly flash and glitter (unless you’re J.J. Abrams – lens flare!). It’s stark and muted, all space-bound and scientific. 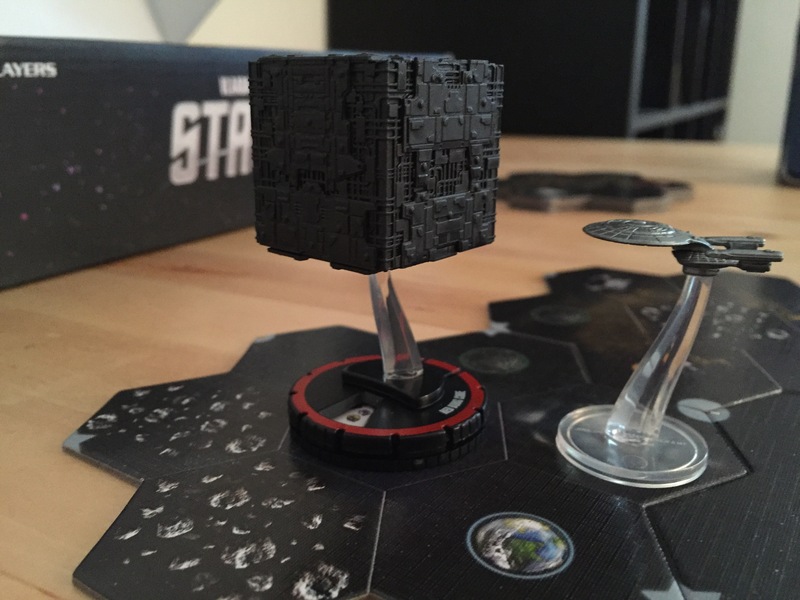 And Star Trek themed games from WizKids, unlike the beautiful work Fantasy Flight does with the Star Wars IP, tend to be screencaps from the show. So we have photos of characters on cards, almost no graphic design on action cards, and dark, muted colors on the exploration tiles. Is this bad? Not if you’re a Star Trek fan. 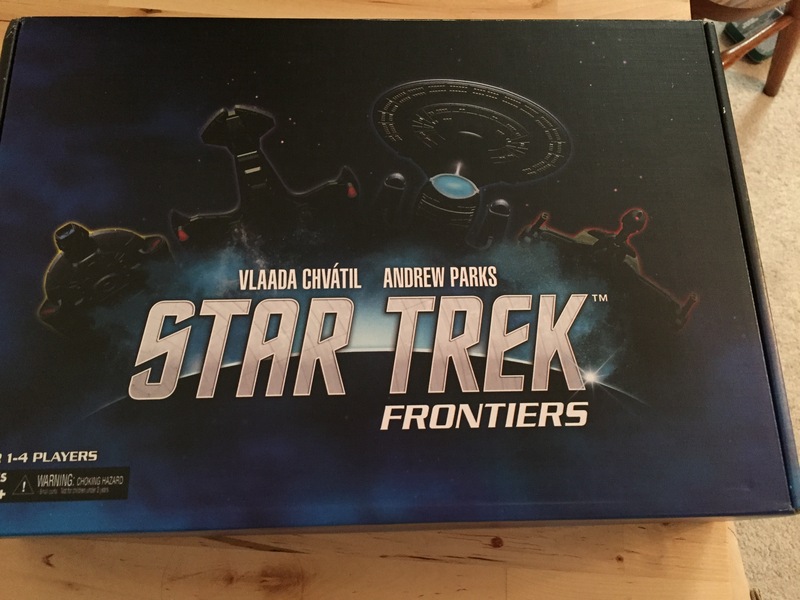 It looks like Star Trek and as it sprawls out over your table it will feel like a Star Trek game, the very best kind – full of exploration and new discoveries. The miniatures here are okay. 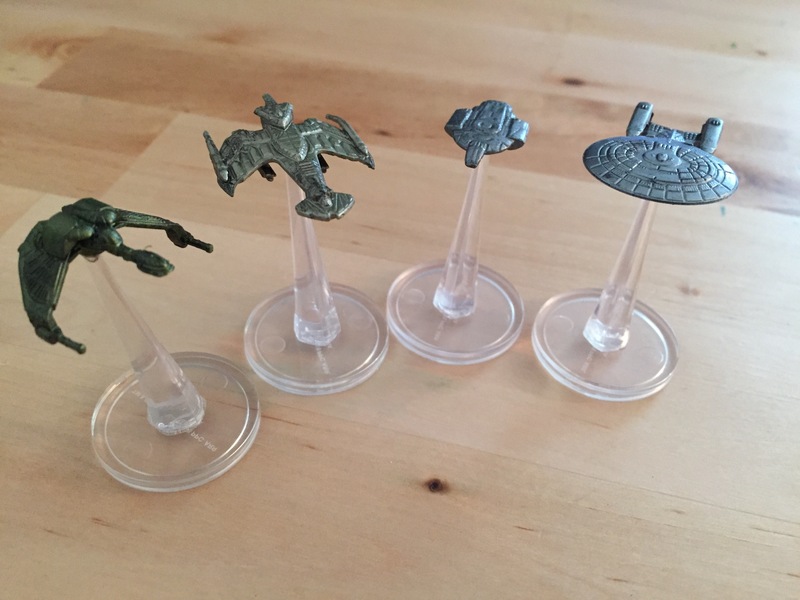 They are the same molds as from Attack Wing with slightly better paint jobs, but this is still WizKids. The intricacy of the Mage Knight models isn’t here, but also missing is the horrendous paint jobs on those original models. 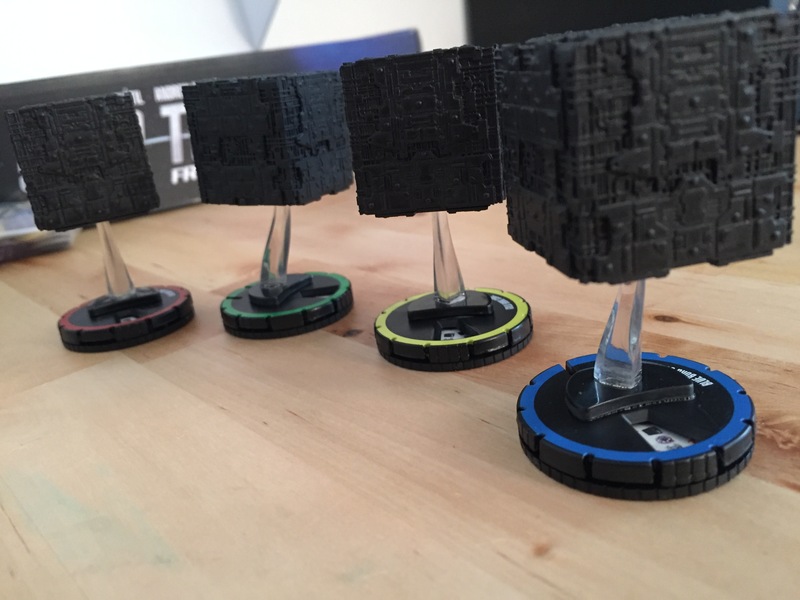 And the Borg Cubes, while identical to each other, look really cool on the table as you hunt the galaxy for them. How Does Star Trek Frontiers Play? Have you played Mage Knight? Okay, then you already know the answer to this question. Yes, it’s more or less the same. I know several owners of the original who also happen to be Star Trek fans are disappointed by this. They want an excuse to buy the new game without negating the purpose of the former. But I can’t honestly recommend you buy this if you already have Mage Knight, especially if you also have the hard to find Mage Knight expansions. 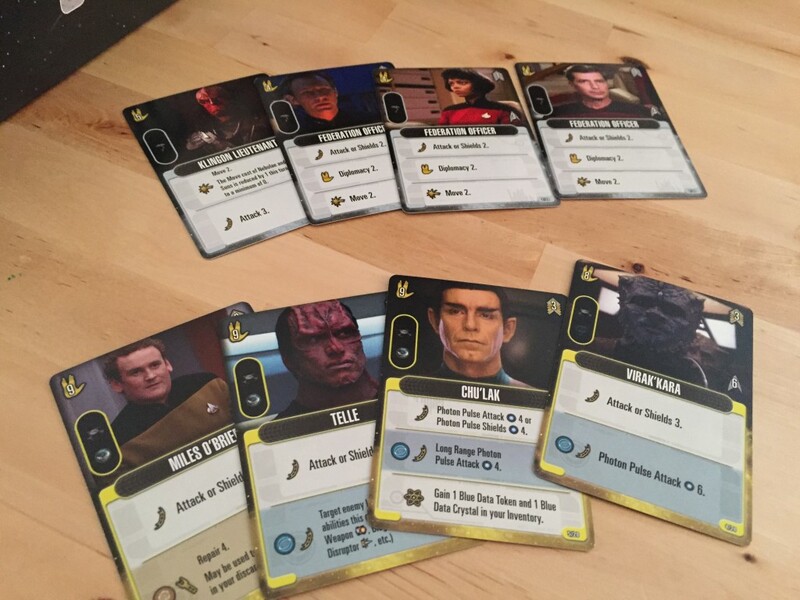 There are some changes – most of them streamlining and simplifying key rules or updating the game to match the theme of Star Trek. Gone is the day/night cycle which frankly would have made no sense in space. Away Missions have been added as well – which makes perfect thematic sense and adds a lot to the game. 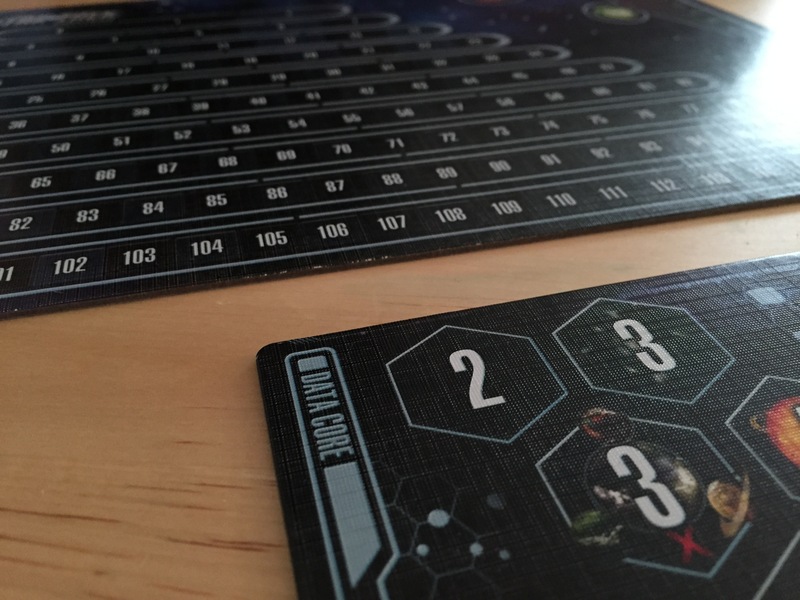 Diplomacy is used before combat, and building your away teams feels a lot like Star Trek – this is probably the most thematic addition to the game. Several changes will feel random to some degree – the mana change for example is strange because it not only reduces the number of colors but changes the color values. Other changes that could have been made were not, resulting in many enemies and units that are almost identical to the originals with a Star Trek theme pasted on. If you’ve played Mage Knight and enjoyed it, then Star Trek Frontiers is more of the same with a new coat of paint and a few interesting but not overly game-changing tweaks. If you’ve never played Mage Knight, you now have two perfectly viable options – pick your favorite theme and give it a go. If you’ve played Mage Knight and did not like it, then Star Trek Frontiers doesn’t change enough to alter your opinion. 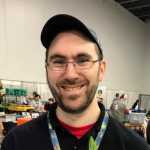 I plan to play the game several more times – both solo and with a small group – to provide a full review from top to bottom. In the meantime, I’m pleased but not blown away by what is a very serviceable and very interesting Star Trek re-skin of one of my favorite games of all time. And for that I’m happy to keep playing.